Austenland Fan Video with Keri Russell and JJ Field! In London after a two-year exile, Lord Blakeney plans to cut a swathe through the bedchambers of the demimonde. Marriage is not on his agenda, especially to an annoying chit like Minerva Montrose, with her superior attitude and a tendency to get into trouble. And certainly thelast man Minerva wants is Blake, a careless wastrel without a thought in his handsome head. The heat and noise of her debutante ball give Minerva a migraine. Surely a moment’s rest could do no harm . . . until Blake mistakes her for another lady, leaving Minerva’s guests to catch them in a very compromising position. To her horror, the scandal will force them to do the unthinkable: marry. Their mutual loathing blazes into unexpected passion but Blake remains distant, desperate to hide a shameful secret. Minerva’s never been a woman to take things lying down, and she’ll let nothing stop her from winning his trust . . . and his heart. You know those romances that feature intriguing secondary characters from previous romances? Well, this is one of those books which takes two characters we love from previous books and gives them their own romance. Surprisingly, I wasn’t even looking forward to this one because the premise didn’t stand out much to me and I thought the hero and heroine were ill matched but I ended up loving it! This one was a surprise success! What do you get when you put an intelligent, outspoken bluestocking and a titled, seemingly dumb hero together? Alot of sparks-both good and bad! Fans of her last books know the hero and heroine as constantly arguing with each other and generally not getting along! They seem like they have nothing in common so it was quite surprising to see them paired up in this book and I had doubts whether they would make a good match. But Miranda does an amazing job of revealing deeper layers to both characters and showing us just how well they suit each other. The hero has a surprising secret that will endear him to readers who previously disliked him and Minerva is delightful with her bold, daring character even though she can be quite immature and impulsive at times. Their romance is full of unexpected sparks that remind one of Lizzy and Darcy type romance. The writing is wonderful-warm, fast-paced with just a sprinkle of wit and humor thrown in. The plot may seem basic enough-guy compromises girl accidentally and they end up in an arranged marriage and of course end up falling in love but Miranda makes her characters so entertaining and real, that it becomes a joy to read! Fans will enjoy revisiting the other couples from the last books and new readers will need to pick up the rest of this wonderful series! Another wonderful romance from the very talented Miranda Neville! Can’t wait to read her next! Verdict: Wonderful opposites attract romance! Look what I found! Ok, I know this is a little irrelevant but I figure there’s a good chance most of us historical junkies are also big Austen fans. Well, you’re gonna love this new set of online videos that feature a updated version of Pride and Prejudice narrated by a modern Lizzie Bennet. New Zombie Period Film: The Curse of the Buxom Strumpet! As if one movie where a bunch of zombies terrorize 1800’s English folk (Pride and Prejudice and Zombies) weren’t enough-Now we have another period zombie movie set to eat our brains! Introducing: The Curse of the Buxom Strumpet, which is the full-length version of a short movie, E’gad Zombies and which will star Ian McKellen, Gillian Anderson and Judi Dench. Lots of big-name period stars in this one! It is due sometime in 2012. Check out the trailer for E’gad Zombies! Don’t about you, but this could be fun! Here’s the link to the official site! Beer Commercial featuring a very twisted Pride and Prejudice! 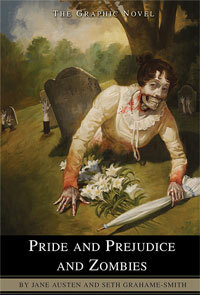 Ahaha, who would have guessed people would use Pride and Prejudice to sell beer? I sure didn’t! This awesome and action packed commercial is totally worth the watch! Hmm, maybe an inkling of what we can expect if P and P and Z ever gets made? Doing a bit of musing in regards to a bit of news pertaining to the new movie based on the bestseller Pride and Prejudice and Zombies. According to Reelz Channel, Natalie Portman has dropped out of the movie and Scarlett Johansson has been replaced as Elizabeth Bennet, with Bradley Cooper as a possible Mr. Darcy. Wow, definitely not people I would ever imagine to play these immortal characters! I thought that Scarlett is too beautiful for Lizzy and Bradley is too Wickham (the bad boy type) to play Darcy. But then having looked though various photos of the two actors, I can actually see how this could work! This picture of a light brunette Scarlett with bright eyes and a playful smile definitely puts me in mind of cheerful Lizzy Bennet. And is it just me, or does she remind you of Keria Knightley in a way? Now, I wasn’t at all convinced that Bradley Cooper could pull off tall, dark, brooding Darcy till I saw this picture… I say he’s definitely got the key smoldering to a tee! What do you guys think about the casting for the movie? Do you think these two are prefect for the role or are there actors you would prefer to see? Comment below and share your thoughts! Just thought I would introduce you all to a new web show in case you haven’t heard of it. Here at Historical Romance Addicts, we love Jane Austen-I mean it’s very possible Historical Romance wouldn’t have existed if it wasn’t for her influence! If you’re a historical buff, you should defnitely check this out as you’ll learn loads of interesting tidbits about life in Regency England. And if you love it and can’t get enough, you could always buy the books!